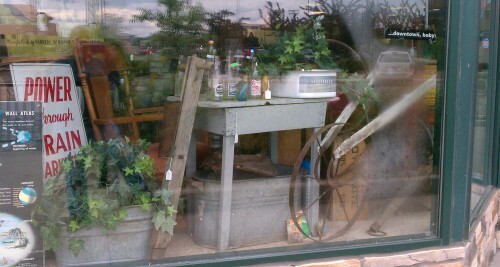 We’ve taken additional space at Antiques On Broadway (Fargo, ND): the big storefront window! Right now we’re showing off some lovely primitive antiques — perfect for the garden, mancave, and your rustic rooms. Taking photos of the outside of such large glass windows is more difficult than I thought! But here’s on scene from the street, featuring an antique cultivator, lots of old galvanized things to plant in, a collection of vintage soda pop bottles, and a enameled vegetable draw from a refrigerator which makes a very cool planter. 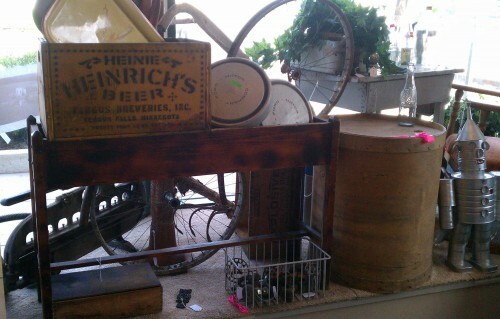 Heinrich beer crate, the old Pepsi bottle cap crate, vintage Ford truck hubcaps, and a few other assorted rustic (and rusty) pieces, such as vintage bike wheels and spigots.